The remaining type is early onset non–Bruton agammaglobulinemia, with low or absent serum immunoglobulin (Ig). Most cases are agammaglobulinemia with autosomal recessive/dominant heritage and represent a very heterogeneous group, including immunoglobulin (Ig) deficiency with increased immunoglobulin M (hyper-IgM syndrome), which is also discussed separately (see X-linked Immunodeficiency With Hyper IgM). In addition, some infants have an initially low Ig level that eventually increases to normal levels. This is known as transient hypogammaglobulinemia of infancy and is discussed in detail in a separate article. Defective antibody production and low circulating numbers of B cells were described in some female infants and in males in whom no Btk abnormalities were detected. These observations imply the involvement of other genes. This article describes the cases of agammaglobulinemia caused by defects other than Btk. However, because the clinical manifestations and treatments are similar, information from Btk -deficient patients is included because of the lack of sufficient numbers of such patients. Finally, some conditions secondary to acquired immunodeficiency are also described because they need to be recognized in addition to the primary diseases. For other B-cell defects, such as specific Ig deficiencies (eg, immunoglobulin A [IgA] or immunoglobulin G [IgG] subclass deficiencies), refer to the article B-Cell Disorders. Although defects may occur in many steps in B-cell development and maturation resulting in the lack of Ig production, the most common and well-described defect is the one at the stage of pro–B-cell to pre–B-cell maturation (see the image below). Early stages of B-cell differentiation can be identified by the status of the immunoglobulin genes and by the cell surface markers CD34, CD19, and surface immunoglobulin (sIg). From: Conley ME. Genes required for B cell development. J Clin Invest. 2003;112: 1636-8. Reproduced with permission of American Society for Clinical Investigation via Copyright Clearance Center. In the fetal bone marrow, the first committed cell in B-cell development is the early pro-B cell, identified by its ability to proliferate in the presence of interleukin-7 (IL-7). 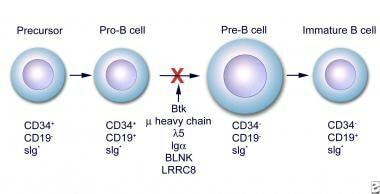 These cells develop into late pro–B cells in which rearrangement of the heavy chain genes occurs. This rearrangement process requires the recombination activating genes RAG1 and RAG2, which are controlled by IL-7 and perhaps other factors. When the heavy chain is produced, it is transported to the cell surface by the Ig-α (CD79a) and Ig-β (CD82) heterodimers or by the surrogate light chain. Progression from this late pro–B-cell to the pre–B-cell stage involves the rearrangement and joining of the various segments of the heavy chain genes. The completion of rearrangement of the light and heavy chains and the presence of surface IgM results in the immature B cell, which then leaves the bone marrow. Increasing expression of IgD in the transitional cells finally results in the mature B cell with IgM and IgD both expressed on their cell surface. The mature B cells circulate between secondary lymphoid organs and migrate into lymphoid follicles of the spleen and lymph nodes in response to further stimuli and various chemokines. T cells stimulate B cells to undergo further proliferation and Ig class switching, leading to the expression of the various isotypes IgG, IgA, or immunoglobulin E (IgE). Mutations on Btk components of the pre–B-cell and B-cell receptor (lambdα5, Ig-α, and Ig-β), or the scaffolding protein BLNK account for approximately 90% of defects in early B-cell development. Mutations in Btk result in Bruton agammaglobulinemia. The defect of µ heavy-chain gene on chromosome 14 is the most frequent abnormality in patients with agammaglobulinemia and decreased B cells but no defect in Btk. Ig-α and Ig-β are encoded by the mb-1 and B29 genes, respectively. A case involving a female patient with a mutation in the Ig-λ5/14/1 gene that resulted in a defect in the surrogate light chain has also been described. Other mutations in the components of the pre–B-cell and B-cell antigen receptor complex (eg, defects in the B-cell linker protein [BLNK]) account for 5-7% of patients with defects in early B-cell development. These patients have normal numbers of pro–B cells but no pre–B or mature B cells. Their clinical features are similar to those of patients with XLA. Activation of B-cell receptor (BCR) induces the recruitment of Syk, which phosphorylates BLNK, a contributor to the activation of Btk that affects other intracellular signaling events. These findings indicate that a defect in any of the steps in B-cell development may be clinically important. Approximately 85% of patients with defects in early B-cell development have XLA. However, when a female patient presents with absence of serum Ig and peripheral blood B cells, such a patient clearly does not have Bruton agammaglobulinemia or mutations in the Btk gene unless she has XO karyotype. The elucidation of her specific gene defects may shed additional information on B-cell development. Such a patient was recently described and subsequent whole exome sequencing found a premature stop codon in exon 6 of PIK3R1. She had in absence of p85α but normal expression of the p50 α and p55 α regulatory subunits of P13K. Bone marrow aspirates showed less than 0.01% CD19+ B cells with normal percentages of TdT+VpreB+CD19- B cell precursors. The exact defects have not yet been determined in other patients in whom agammaglobulinemia has been associated with a mosaic of ring chromosome 18  or hypogammaglobulinemia in a male with ring chromosome 21. Patients with B-cell deficiency associated with intrauterine growth retardation have been described,  and patients with agammaglobulinemia with spondyloepiphyseal dysplasia and retinal dystrophy have also been described. The syndrome of X-linked hypogammaglobulinemia with growth hormone deficiency has also been reported. This has been mapped to the same region that encompasses the Btk gene and may involve a gene that controls growth hormone production, implying a small contiguous gene deletion that includes both the gene for XLA and another closely linked gene involved in growth hormone production. The structural gene for growth hormone is located on the long arm of chromosome 17. In addition to the genetic defects described above, other pathophysiology mechanisms may result in hypogammaglobulinemia or agammaglobulinemia, such as viral infections, malignancy, or drug effects. These are described in more detail in Causes. Agammaglobulinemia occurs in approximately 1 in 250,000 males in the United States. In Caucasians, between 60 and 70% of primary immunodeficiencies are antibody-deficiencies. Patients who received intravenous IgG (IVIG) before age 5 years have lower morbidity and mortality rates than previously identified patients who were treated only with fresh-frozen plasma (FFP) and intramuscular Ig (IMIG); achieving IgG levels near normal or even above 200 mg/dL is difficult using FFP or IMIG. Patients who receive IVIG or subcutaneous IgG (SCIG) therapy regularly may have a near-normal lifestyle. Patients are known to survive into the seventh decade of life. Viral and pulmonary infections cause more than 90% of mortalities. Patients with agammaglobulinemia are at risk of frequent and recurrent infections. Severe bacterial infections resulting in pneumonias or meningitis and subsequent bacteremia could be fatal; however, the major causes of morbidity are chronic upper pulmonary disease (eg, sinusitis) or lower pulmonary disease (eg, bronchiectasis). In patients with agammaglobulinemia, one study indicated that, although the incidence of bacterial infections resulting in hospitalization decreased from 0.40-0.06 per patient per year during intravenous Ig replacement, chronic sinusitis and bronchiectasis continue to occur. Central nervous enteroviral infections can be especially disabling, resulting in a long-term CNS debilitating state. Autoimmune and allergic manifestations are another source of morbidity in these patients. Because of passive, transplacental acquisition of maternal IgG, newborns have normal levels of serum IgG and do not have problems until the IgG is catabolized. Because newborns cannot produce their own Ig, increased susceptibility to infections develops in infants older than 6 months. Patients with non-Btk mutations tend to be younger at the time of diagnosis, and they are more likely to have severe complications. York NR, de la Morena MT. 50 years ago in the journal of pediatrics: a decade with agammaglobulinemia. J Pediatr. 2012 May. 160(5):756. Khan WN. Colonel Bruton's kinase defined the molecular basis of X-linked agammaglobulinemia, the first primary immunodeficiency. J Immunol. 2012 Apr 1. 188(7):2933-5. [Medline]. Samson M, Audia S, Lakomy D, et al. Diagnostic strategy for patients with hypogammaglobulinemia in rheumatology. Joint Bone Spine. 2011 May. 78(3):241-5. [Medline]. Nelson KS, Lewis DB. Adult-onset presentations of genetic immunodeficiencies: genes can throw slow curves. Curr Opin Infect Dis. 2010 Aug. 23(4):359-64. [Medline]. Conley ME, Famer DM, Dobbs AK, et al. A minimally hypomorphic mutation in Btk resulting in reduced B cell numbers but no clinical disease. Clin Exp Immunol. 2008. 152:39-44. Conley ME, Dobbs AK, Quintana AM, et al. Agammaglobulinemia and absent B lineage cells in a patient lacking the p85a subunit of PI3K. J Exp Med. 2012 Mar 12. 209(3):463-70. [Medline]. [Full Text]. Litzman J, Brysova V, Gaillyova R, et al. Agammaglobulinaemia in a girl with a mosaic of ring 18 chromosome. J Paediatr Child Health. 1998 Feb. 34(1):92-4. [Medline]. Ohga S, Nakao F, Narazaki O, et al. Hypogammaglobulinaemia in a patient with ring chromosome 21. Arch Dis Child. 1997 Sep. 77(3):252-4. [Medline]. Revy P, Busslinger M, Tashiro K, et al. A syndrome involving intrauterine growth retardation, microcephaly, cerebellar hypoplasia, B lymphocyte deficiency, and progressive pancytopenia. Pediatrics. 2000 Mar. 105(3):E39. [Medline]. Roifman CM. Antibody deficiency, growth retardation, spondyloepiphyseal dysplasia and retinal dystrophy: a novel syndrome. Clin Genet. 1999 Feb. 55(2):103-9. [Medline]. Stewart DM, Tian LL, Notaranelo LD, Nelson DL. X-linked hypogammaglobulinemia and isolated growth hormone deficiency: an update. Immunol Rev. 2008. 40:262-70. [Medline]. al-Attas RA, Rahi AH. Primary antibody deficiency in Arabs: first report from eastern Saudi Arabia. J Clin Immunol. 1998 Sep. 18(5):368-71. [Medline]. Bousfiha AA, Jeddane L, El Hafidi N, Benajiba N, Rada N, El Bakkouri J, et al. First Report on the Moroccan Registry of Primary Immunodeficiencies: 15 Years of Experience (1998-2012). J Clin Immunol. Mar 2914. E PUB. [Medline]. Leal RC, Bertelli EC, Soler ZA. Recurrent pneumonia caused by genetic immunodeficiency: a prophylactic and rehabililtative approach. Braz J Infect Dis. 2007. 11:307-10. [Medline]. Lam DS, Lee TL, Chan KW, et al. Primary immunodeficiency in Hong Kong and the use of genetic analysis for diagnosis. Hong Kong Med J. 2005 Apr. 11(2):90-6. [Medline]. Wang LL, Jin YY, Hao YQ, et al. Distribution and clinical features of primary immunodeficiency diseases in Chinese children (2004-2009). J Clin Immunol. 2011 Jun. 31(3):297-308. [Medline]. de Silva NR, Gunawardena S, Rathnayake D, Wickramasingha GD. Spectrum of primary immunodeficiency disorders in Sri Lanka. Allergy Asthma Clin Immunol. Dec 2013. 9:50. [Medline]. Schatorjé EJ, Gathmann B, van Hout RW, de Vries E; PedPAD consortium. The PedPAD study: Boys predominate in the hypogammaglobulinemia registry of the ESID Online Database. Clin Exp Immunol. Feb 2014. Epub. [Medline]. van den Bruele T, Mourad-Baars PE, Claas EC, et al. Campylobacter jejuni bacteremia and Helicobacter pylori in a patient with X-linked agammaglobulinemia. Eur J Clin Microbiol Infect Dis. 2010 Nov. 29(11):1315-9. [Medline]. [Full Text]. Vancikova Z, Freiberger T, Vach W, Trojanek M, Rizzi M, Janda A. X-linked agammaglobulinemia in community-acquired pneumonia cases revealed by immunoglobulin level screening at hospital admission. Klin Padiatr. Nov 2013. 225:339-42. [Medline]. Mamishi S, Shahmahmoudi S, Tabatabaie H, et al. Novel BTK mutation presenting with vaccine-associated paralytic poliomyelitis. Eur J Pediatr. 2008 Nov. 167(11):1335-8. [Medline]. [Full Text]. Shaghaghi M, Parvaneh N, Ostad-Rahimi P, Fathi SM, Shahmahmoodi S, Abolhassani H, et al. Combined immunodeficiency presenting with vaccine-associated paralytic poliomyelitis: a case report and narrative review of literature. Immunol Invest. 2014. 43:292-8. [Medline]. Rudge P, Webster AD, Revesz T, et al. Encephalomyelitis in primary hypogammaglobulinaemia. Brain. 1996 Feb. 119 ( Pt 1):1-15. [Medline]. Katamura K, Hattori H, Kunishima T, et al. Non-progressive viral myelitis in X-linked agammaglobulinemia. Brain Dev. 2002 Mar. 24(2):109-11. [Medline]. Wildenbeest JG, van den Broek PJ, Benschop KS, et al. Pleconaril revisited: clinical course of chronic enteroviral meningoencephalitis after treatment correlates with in vitro susceptibility. Antivir Ther. 2012. 17(3):459-66. [Medline]. Sveinsson O, Matell H, Herrman L. Progressive multifocal leukoencephalopathy in a patient with Good's syndrome. BMJ Case Rep. Jul 2013. 284(1-2):2013. [Medline]. Mancuso A, Gentiluomo M, Vangeli M, Torre MD, Belli LS. Diarrhea as sole presentation of Good's syndrome mimicking Crohn's disease. Clin Immunol. Apr 2013. 147:9-10. [Medline]. Agarwal S1, Mayer L. Diagnosis and treatment of gastrointestinal disorders in patients with primary immunodeficiency. Clin Gastroenterol Hepatol. Sep 2013. 11:1050-63. [Medline]. Bloom KA, Chung D, Cunningham-Rundles C. Osteoarticular infectious complications in patients with primary immunodeficiencies. Curr Opin Rheumatol. 2008 Jul. 20(4):480-5. [Medline]. [Full Text]. Gavrilova T, Capitle E. A case of relapsing polychondritis and hypogammaglobulinemia. Ann Allergy Asthma Immunol. Aug 2013. 111:147-8. Wynes J, Harris W 4th, Hadfield RA, Malay DS. Subtalar joint septic arthritis in a patient with hypogammaglobulinemia. J Foot Ankle Surg. Mar-Apr 2013. 52:242-8. [Medline]. Sato H, Iino N, Ohashi R, Saeki T, Ito T, Saito M, et al. Hypogammaglobulinemic patient with polyarthritis mimicking rheumatoid arthritis finally diagnosed as septic arthritis caused by Mycoplasma hominis. Intern Med. 2012. 51:425-9. [Medline]. Sukumaran S, Marzan K, Shaham B, Church JA. A child with x-linked agammaglobulinemia and enthesitis-related arthritis. Int J Rheumatol. 2011. 2011:175973. [Medline]. [Full Text]. Bonkowsky JL, Bohnsack JF, Pennington MJ, et al. Leukoencephalopathy, arthritis, colitis, and hypogammaglobulinemia (LACH) in two brothers: a novel syndrome?. Am J Med Genet A. 2004. 128:52-6. [Medline]. Farmer DG, Kattan OM, Wozniak LJ, Marcus E, Ponthieux S, Hwang V, et al. Incidence, timing, and significance of early hypogammaglobulinemia after intestinal transplantation. Transplantation. May 2013. 95:1154-9. [Medline]. Mozer-Glassberg Y, Shamir R, Steinberg R, Kadmon G, Har-Lev E, Mor E, et al. Hypogammaglobulinemia in the early period after liver transplantation in children. Clin Transplant. May-Jun 2013. 27:E289-94. [Medline]. Chambers DC, Davies B, Mathews A, Yerkovich ST, Hopkins PM. Bronchiolitis obliterans syndrome, hypogammaglobulinemia, and infectious complications of lung transplantation. J Heart Lung Transplant. Jan 2013. 32:36-43. [Medline]. Carbone J, Sarmiento E, Del Pozo N, Rodriguez-Molina JJ, Navarro J, Fernandez-Yañez J, et al. Restoration of humoral immunity after intravenous immunoglobulin replacement therapy in heart recipients with post-transplant antibody deficiency and severe infections. Clin Transplant. May-Jun 2013. 26:e277-83. [Medline]. Akman S, Guven AG, Ince S, et al. IgG and IgG subclasses deficiency in children undergoing continuous ambulatory peritoneal dialysis and its provocative factors. Pediatr Int. 2002 Jun. 44(3):273-6. [Medline]. Rehman S, Bytnar D, Berkenbosch JW, et al. Hypogammaglobulinemia in pediatric ICU patients. J Intensive Care Med. 2003 Sep-Oct. 18(5):261-4. [Medline]. Dotta L, Tassone L, Badolato R. Clinical and genetic features of Warts, Hypogammaglobulinemia, Infections and Myelokathexis (WHIM) syndrome. Curr Mol Med. 2011 Jun. 11(4):317-25. [Medline]. Agarwal S, Cunningham-Rundles C. Thymoma and immunodeficiency (Good syndrome): a report of 2 unusual cases and review of the literature. Ann Allergy Asthma Immunol. 2007. 98:185-90. [Medline]. Sawada A, Takihara Y, Kim JY, et al. A congenital mutation of the novel gene LRRC8 causes agammaglobulinemia in humans. J Clin Invest. 2003 Dec. 112(11):1707-13. [Medline]. Lougaris V, Vitali M, Baronio M, Moratto D, Tampella G, Biasini A, et al. Autosomal Recessive Agammaglobulinemia: The Third Case of Igβ Deficiency Due to a Novel Non-sense Mutation. J Clin Immunol. Apr 2014. epub. [Medline]. Khalili A1, Plebani A, Vitali M, Abolhassani H, Lougaris V, Mirminachi B, et al. Autosomal Recessive Agammaglobulinemia: A Novel Non-sense Mutation in CD79a. J Clin Immunol. Feb 2014. 34:138-41. [Medline]. Boisson B, Wang YD, Bosompem A, Ma CS, Lim A, Kochetkov T, et al. A recurrent dominant negative E47 mutation causes agammaglobulinemia and BCR(-) B cells. J Clin Invest. Nov 2013. 123:4781-5. [Medline]. Hugle B, Hoffman H, Bird LM, et al. Hoffman syndrome: New patients, new insights. Am J Med Genet A. 2011 Jan. 155A(1):149-53. [Medline]. Zhang ZY, Zhao XD, Jiang LP, et al. Clinical characteristics and molecular analysis of 21 Chinese children with congenital agammaglobulinemia. Scand J Immunol. 2010 Nov. 72(5):454-9. [Medline]. Onigbanjo MT, Orange JS, Perez EE, Sullivan KE. Hypogammaglobulinemia in a pediatric tertiary care setting. Clin Immunol. 2007. 125:52-9. [Medline]. Casulo C, Maragulia J, Zelenetz AD. Incidence of hypogammaglobulinemia in patients receiving rituximab and the use of intravenous immunoglobulin for recurrent infections. Clin Lymphoma Myeloma Leuk. Apr 2013. 13:106-11. [Medline]. Besada E, Bader L, Nossent H. Sustained hypogammaglobulinemia under rituximab maintenance therapy could increase the risk for serious infections: a report of two cases. Rheumatol Int. Jun 2013. 33:1643-4. [Medline]. Ozaras N, Goksugur N, Eroglu S, Tabak O, Canbakan B, Ozaras R. Carbamazepine-induced hypogammaglobulinemia. Seizure. Apr 2012. 21:229-31. [Medline]. Okumura A, Tsuge I, Kamachi Y et al. Transient hypogammaglobulinemia after antileptic drug hypersensitivity. Pediatr Neurol. 2007. 36:342-4. [Medline]. Boccara O, Valevrie-Allanore L, Crickx B et al. Association of hypogammaglobulinemia with DRESS (Drug Rash with Eosinophilia and Systemic Symptoms). Eur J Dermatol. 2006. 16:666-8. [Medline]. [Full Text]. Kawano T, Matsuse H, Obase Y, et al. Hypogammaglobulinemia in steroid-dependent asthmatics correlates with the daily dose of oral prednisolone. Int Arch Allergy Immunol. 2002 Jul. 128(3):240-3. [Medline]. Kitamura A, Takiguchi Y, Tochigi N, et al. Durable hypogammaglobulinemia associated with thymoma (Good syndrome). Intern Med. 2009. 48(19):1749-52. [Medline]. Yong PF, Aslam L, Karim MY, Khamashta MA. Management of hypogammaglobulinaemia occurring in patients with systemic lupus erythematosus. Rheumatology (Oxford). 2008 Sep. 47(9):1400-5. [Medline]. Carneiro-Sampaio M, Liphaus BL, Jesus AA, Silva CA, Oliveira JB, Kiss MH. Understanding systemic lupus erythematosus physiopathology in the light of primary immunodeficiencies. J Clin Immunol. 2008 May. 28 Suppl 1:S34-41. [Medline]. Lankisch P, Laws HJ, Weiss M, Borkhardt A. Agammaglobulinemia and lack of immunization protection in exudative atopic dermatitis. Eur J Pediatr. Jan 2014. 173:117-9. [Medline]. Ghoshal UC, Goel A, Ghoshal U, et al. Chronic diarrhea and malabsorption due to hypogammaglobulinemia: a report on twelve patients. Indian J Gastroenterol. 2011 Jul. 30(4):170-4. [Medline]. Furtado AK, Cabral VL, Santos TN, Mansour E, Nagasako CK, Lorena SL, et al. Giardia infection: protein-losing enteropathy in an adult with immunodeficiency. World J Gastroenterol. May 2012. 18:2430-3. [Medline]. Orange JS, Geha RS, Bonilla FA. Acute chylothorax in children: selective retention of memory T cells and natural killer cells. J Pediatr. 2003. 143:243-9. [Medline]. Bezrodnik L, Raccio AC, Canil LM, Rey MA, Carabajal PC, FOssati CA, et al. Hypogammaglobulinemia secondary to cow-milk allergy in children under 2 years of age. Immunology. 2007. 122:140-6. [Medline]. Ricci G, Piccinno V, Giannetti A, et al. Evolution of hypogammaglobulinemia in premature and full-term infants. Int J Immunopathol Pharmacol. 2011 Jul-Sep. 24(3):721-6. [Medline]. Ozen A, Baris S, Karakoc-Aydiner E, et al. Outcome of hypogammaglobulinemia in children: immunoglobulin levels as predictors. Clin Immunol. 2010 Dec. 137(3):374-83. [Medline]. Kainulainen L, Vuorinen T, Rantakokko-Jalava K, Osterback R, Ruuskanen O. Recurrent and persistent respiratory tract viral infections in patients with primary hypogammaglobulinemia. J Allergy Clin Immunol. 2010 Jul. 126(1):120-6. [Medline]. Bondioni MP, Duse M, Plebani A et al. Pulmonary and sinusal changes in 45 patients with primary immunodeficiencies: computed tompgraphy evaluation. J Comput Assist Tompgr. 2007. 31:620-8. [Medline]. Gharagozlou M, Ebrahimi FA, Farhoudi A, et al. Pulmonary complications in primary hypogammaglobulinemia: a survey by high resolution CT scan. Monaldi Arch Chest Dis. Jun 2006. 65:69-74. Tavakol M, Kouhi A, Abolhassani H, Ghajar A, Afarideh M, Shahinpour S, et al. Otological findings in pediatric patients with hypogammaglobulinemia. Iran J Allergy Asthma Immunol. Jun 2014. 13:166-73. [Medline]. Chinen J, Shearer WT. Subcutaneous immunoglobulins: alternative for the hypogammaglobulinemic patient?. J Allergy Clin Immunol. 2004. 114:934-5. [Medline]. Ochs, HD, Gupta S, Kiseeling P et al. Safety and efficacy of self-administered subcutaneous immunoglobulin in patients with primary immunodeficiency diseases. J Clin Immunol. 2006. 26:265-73. [Medline]. Gustafson R, Gardulf A, Hansen S et al. Rapid subcutaneous immunoglobulin administration every second week results in high and stable serum immunoglobulin G levels in patients with primary antibody deficiencies. Clin Exp Immunol. 2008. 152:274-9. [Medline]. Orange JS, Grossman WJ, Navickis RJ, Wilkes MM. Impact of trough IgG on pneumonia incidence in primary immunodeficiency: A meta-analysis of clinical studies. Clin Immunol. 2010 Oct. 137(1):21-30. [Medline]. Berger M. Incidence of infection is inversely related to steady-state (trough) serum IgG level in studies of subcutaneous IgG in PIDD. J Clin Immunol. 2011 Oct. 31(5):924-6. [Medline]. Lacy CF, Armstrong LL, Goldman MP, Lance LL, eds. Drug Information Handbook 2008-2009. 16th edition. Cleveland, OH: Lexi-Comp Inc; 2008. Hooper JA. Intravenous immunoglobulins: evolution of commercial IVIG preparations. Immunol Allergy Clin North Am. 2008 Nov. 28(4):765-78, viii. [Medline]. Shah S. Pharmacy considerations for the use of IGIV therapy. Am J Health Syst Pharm. 2005 Aug 15. 62(16 Suppl 3):S5-11. [Medline]. Siegel J. The Product: All intravenous immunoglobulins are not equivalent. Pharmacother. 2005. 25(11 Pt 2):78S-84S. Shaghaghi M, Parvaneh N, Ostad-Rahimi P, Fathi SM, Shahmahmoodi S, Abolhassani H, et al. Combined immunodeficiency presenting with vaccine-associated paralytic poliomyelitis: a case report and narrative review of literature. Immunol Invest. Mar 2014. 43:292-8. [Medline]. Gonzalo-Garijo MA, Sánchez-Vega S, Pérez-Calderón R, Pérez-Rangel I, Corrales-Vargas S, Fernández de Mera JJ, et al. Renal amyloidosis in a patient with X-linked agammaglobulinemia (Bruton's disease) and bronchiectasis. J Clin Immunol. Jan 2014. 34:119-22. [Medline]. Howard V, Myers LA, Williams DA, et al. Stem cell transplants for patients with X-linked agammaglobulinemia. Clin Immunol. 2003 May. 107(2):98-102. [Medline]. Quinti I, Pierdominici M, Marziali M, et al. European surveillance of immunoglobulin safety--results of initial survey of 1243 patients with primary immunodeficiencies in 16 countries. Clin Immunol. 2002 Sep. 104(3):231-6. [Medline]. Buckley RH. Pulmonary complications of primary immunodeficiencies. Paediatr Respir Rev. 2004. 5 (Suppl A):S225-33. [Medline]. Chen Y, Stirling RG, Paul E, et al. Longitudinal decline in lung function in patients with primary immunoglobulin deficiencies. J Allergy Clin Immunol. 2011 Jun. 127(6):1414-7. [Medline]. Ozcan C, Metin A, Erkoçoğlu M, Kocabas CN. Bronchial hyperreactivity in children with antibody deficiencies. Allergol Immunopathol (Madr). Jan 2014. Epub. [Medline]. Quinti I, Soresina A, Guerra A, et al. Effectiveness of immunoglobulin replacement therapy on clinical outcome in patients with primary antibody deficiencies: results from a multicenter prospective cohort study. J Clin Immunol. 2011 Jun. 31(3):315-22. [Medline]. Patiroglu T, Akyildiz B, Patiroglu TE, Gulmez IY. Recurrent pulmonary alveolar proteinosis secondary to agammaglobulinemia. Pediatr Pulmonol. 2008 Jul. 43(7):710-3. [Medline]. Berlucchi M, Soresina A, Redaelli De Zinis LO, et al. Sensorineural hearing loss in primary antibody deficiency disorders. J Pediatr. 2008 Aug. 153(2):293-6. [Medline]. Ishimura M, Takada H, Doi T, et al. Nationwide survey of patients with primary immunodeficiency diseases in Japan. J Clin Immunol. 2011 Dec. 31(6):968-76. [Medline]. Brosens LA, Tytgat KM, Morsink FH et al. Multiple colorectal neoplasms in X-linked agammaglobulinemia. Clin Gastroenterol Hepatol. 2008. 6:115-9. [Medline]. Slotta JE, Heine S, Kauffels A, et al. Gastrectomy with isoperistaltic jejunal parallel pouch in a 15-year-old adolescent boy with gastric adenocarcinoma and autosomal recessive agammaglobulinemia. J Pediatr Surg. 2011 Sep. 46(9):e21-4. [Medline]. Ziegner UH,, Kobayashi RH, Cunningham-Rundles C, et al. Progressive neurodegeneration in patients with primary immunodeficiency disease on IVIG treatment. Clin Immunol. 2002. 102:19-24. [Medline]. Papapetropoulos S, Friedman J, Blackstone C et al. A progressive, fatal dystonia-Parkinsonism syndrome in a patient with primary immunodeficiency receiving chronic IBIG therapy. Mov Disord. 2007. 22:1664-6. [Medline]. Cunningham-Rundles C. Autoimmunity in primary immune deficiency: taking lessons from our patients. Clin Exp Immunol. 2011 Jun. 164 Suppl 2:6-11. [Medline]. [Full Text]. Dalal I, Reid B, Nisbet-Brown E, Roifman CM. The outcome of patients with hypogammaglobulinemia in infancy and early childhood. J Pediatr. 1998 Jul. 133(1):144-6. [Medline]. Kidon MI, Handzel ZT, Schwartz R, et al. Symptomatic hypogammaglobulinemia in infancy and childhood - clinical outcome and in vitro immune responses. BMC Fam Pract. 2004 Oct 21. 5:23. [Medline]. Desar IM, Weemaes CM, van Deuren M et al. Reversible hypogammaglubulinaemia. Neth J Med. 2007. 65:381-5. [Medline]. Aghamohammadi A, Moin M, Farhoudi A, et al. Efficacy of intravenous immunoglobulin on the prevention of pneumonia in patients with agammaglobulinemia. FEMS Immunol Med Microbiol. 2004 Mar 8. 40(2):113-8. [Medline]. Baumgart KW, Britton WJ, Kemp A, et al. The spectrum of primary immunodeficiency disorders in Australia. J Allergy Clin Immunol. 1997 Sep. 100(3):415-23. [Medline]. Black C, Zavod MB, Gosselin BJ. Haemophilus influenzae lymphadenopathy in a patient with agammaglobulinemia: clinical-histologic-microbiologic correlation and review of the literature. Arch PatholLab Med. 2005. 129:100-3. [Medline]. Buehring I, Friedrich B, Schaaf J, et al. Chronic sinusitis refractory to standard management in patients with humoral immunodeficiencies. Clin Exp Immunol. 1997 Sep. 109(3):468-72. [Medline]. Conley ME. Early defects in B cell development. Curr Opin Allergy Clin Immunol. 2002. 2:517-22. [Medline]. Conley ME, Broides A, Hernandez-Trujillo V, et al. Genetic analysis of patients with defects in early B-cell development. Immunol Rev. 2005. 203:216-34. [Medline]. Conley ME, Dobbs AK, Farmer DM, et al. Primary B cell immunodeficiencies: comparisons and contrasts. Annu Rev Immunol. 2009. 27:199-227. [Medline]. Dittrich AM, Schulze I, Magdorf K, et al. X-linked agammaglobulinaemia and Pneumocystis carinii pneumonia--an unusual coincidence?. Eur J Pediatr. 2003 Jun. 162(6):432-3. [Medline]. Eijkhout HW, van Der Meer JW, Kallenberg CG, et al. The effect of two different dosages of intravenous immunoglobulin on the incidence of recurrent infections in patients with primary hypogammaglobulinemia. A randomized, double-blind, multicenter crossover trial. Ann Intern Med. 2001 Aug 7. 135(3):165-74. [Medline]. Eley BS, Hughes J, Cooper M, Pienaar S, Beatty DW. Primary immunodeficiency diseases at Red Cross War Memorial Children's Hospital. S Afr Med J. 1997 Dec. 87(12):1684-8. [Medline]. Ferrari S, Lougaris V, Caraffi S, et al. Mutations of the Igbeta gene cause agammaglobulinemia in man. J Exp Med. 2007 Sep 3. 204(9):2047-51. [Medline]. Feydy A, Sibilia J, De Kerviler E, et al. Chest high resolution CT in adults with primary humoral immunodeficiency. Br J Radiol. 1996 Dec. 69(828):1108-16. [Medline]. Fijolek J, Wiatr E, Demkow U, Orlowsk TM. Immunological disturbances in Good's syndrome. Clin Invest Med. 2009 Aug 1. 32(4):E301-6. [Medline]. Halsey NA, Pinto J, Espinosa-Rosales F et al. Search for poliovirus carriers among people with primary immune deficiency diseases in the United States, Mexico, Brazil and the United Kingdom. Bull World Heatlh Organ. 2004. 82:3-8. [Medline]. Kainulainen L, Nikoskelainen J, Vuorinen T, et al. Viruses and bacteria in bronchial samples from patients with primary hypogammaglobulinemia. Am J Respir Crit Care Med. 1999 Apr. 159(4 Pt 1):1199-204. [Medline]. Kano Y, Inaoka M, Shiohara T. Association between anticonvulsant hypersensitivity syndrome and human herpes 6 reactivation and hypogammaglobulinemia. Arch Dermatol. 2004. 140:183-8. [Medline]. Kawai T, Malech HL. WHIM syndrome: congenital immune deficiency disease. Curr Opin Hematol. 2009 Jan. 16(1):20-6. [Medline]. [Full Text]. Kutukculer N, Gulez N. The outcome of patients with unclassified hypogammaglobulinemia in early childhood. Pediatr Allergy Immunol. 2009 Nov. 20(7):693-8. [Medline]. Liu Y, Wu Y, Lam KT, Lee PP, Tu W, Lau YL. Dendritic and T Cell Response to Influenza is Normal in the Patients with X-Linked Agammaglobulinemia. J Clin Immunol. 2012 Feb 1. [Medline]. [Full Text]. Mila J, Matamoros N, Pons de Ves J, et al. [The Spanish Registry of Primary Immunodeficiencies. REDIP-1998]. Sangre (Barc). 1999 Apr. 44(2):163-7. [Medline]. Morales P, Hernandez D, Vicente R, et al. Lung transplantation in patients with x-linked agammaglobulinemia. Transplant Proc. 2003 Aug. 35(5):1942-3. [Medline]. Mueller BU, Pizzo PA. Cancer in children with primary or secondary immunodeficiencies. J Pediatr. 1995 Jan. 126(1):1-10. [Medline]. Ozdoba C, Ramelli G, Schroth G. MRI in a patient with congenital agammaglobulinaemia. Neuroradiology. 1998 Aug. 40(8):516-8. [Medline]. Plebani A, Soresina A, Rondelli R, et al. Clinical, immunological, and molecular analysis in a large cohort of patients with X-linked agammaglobulinemia: an Italian multicenter study. Clin Immunol. 2002 Sep. 104(3):221-30. [Medline]. Quartier P, Debre M, De Blic J, et al. Early and prolonged intravenous immunoglobulin replacement therapy in childhood agammaglobulinemia: a retrospective survey of 31 patients. J Pediatr. 1999 May. 134(5):589-96. [Medline]. Raynaud M, Ronce N, Ayrault AD, et al. X-linked mental retardation with isolated growth hormone deficiency is mapped to Xq22-Xq27.2 in one family. Am J Med Genet. 1998 Mar 19. 76(3):255-61. [Medline]. Skull S, Kemp A. Treatment of hypogammaglobulinaemia with intravenous immunoglobulin, 1973-93. Arch Dis Child. 1996 Jun. 74(6):527-30. [Medline]. Teramoto T, Kaneko H, Funato M, et al. Progressive multifocal leukoencephalopathy in a patient with X-linked agammaglobulinemia. Scand J Infect Dis. 2003. 35(11-12):909-10. [Medline]. Tokuda K, Nishi J, Miyanohara H, et al. Relapsing cellulitis associated with Campylobacter coli bacteremia in an agammaglobulinemic patient. Pediatr Infect Dis J. 2004 Jun. 23(6):577-9. [Medline]. Wang LJ, Yang YH, Lin YT, Chiang BL. Immunological and clinical features of pediatric patients with primary hypogammaglobulinemia in Taiwan. Asian Pac J Allergy Immunol. 2004. 22:25-31. [Medline].